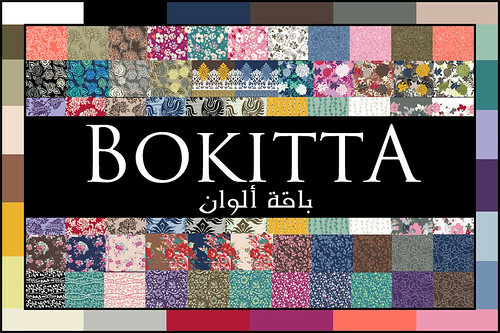 I recently came across a new brand called Bokitta, which just happens to be based in Lebanon. It goes without saying that Lebanon has produced some fantastic designers (if I do say so myself! ), but actually I've realised there are very few brands which cater for hijab-wearing Muslim women. Naturally, I was intrigued, and so here is a quick Q&A with Hala Absi, the founder of Bokitta. Jana: What is Bokitta and how did it begin? Hala: Bokitta is a new innovative brand for hijabis; it started from a passion for fashion and became a successful design house for veiled ladies. The word Bokitta is a new word we invented by combining the word "bouquet", meaning an arrangement, and added the "itta" to refer to the lady. 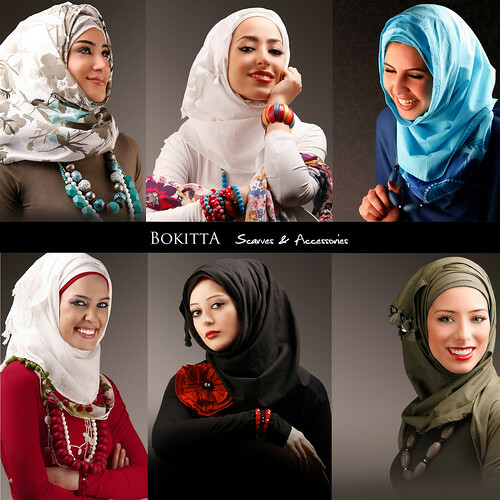 Bokitta, the bouquet of colors, offers an arrangement of matching, bright and colorful scarves and clothing for hijabis, under the Matching Concepts. Most importantly is our new patented scarf "Voila!". This is a pre-wrapped, ready-to-wear scarf which does not require any pins. This new invention has found a lot of success because of its practicality; it is light and breathable, especially for summer and hot weather. The scarf is being sold in two stores across Lebanon launched in May 2011, one in Beirut Mall and another in Saida Mall and hopefully we are to expand to 2 other locations soon. Jana: Tell us more about your patented design. Hala: Voila!, our new patented scarf is a ready-to-wear headscarf. It is designed in such a way that it looks like a naturally wrapped scarf, yet with all the extra layers of fabric that are usually wrapped around the neck eliminated for a lighter feeling. The Voila! is stitched and requires no pins whatsoever, and is worn simply and easily like a hat. It is made of 100% breathable cotton, for healthier hair and scalp, and comes with a headband in the same fabric that will hold the hair back from falling on the face. The Voila! preserves its consistent look, and therefore it does not loosen up after a long day, and you need not fix it with several pins on your head, and need not search for any lost pins. You can watch this YouTube video to see how simple it is to wear the Voila!. Jana: What do you think is special or unique about hijab style in Lebanon? Hala: Lebanon is often called the Paris of the Middle East. Women in Lebanon tend to be trendy and care to stay in style. This is also reflected in the veiled girls' dress in Lebanon; they always try to stay in style but are conservative and modest in their clothing. We do not have one particular style for hijabis in Lebanon; you can find alot of diversity in different regions of the country. The younger generation tend to be more daring with colors and fashionable items; they wear long tunics with pants or short ones with skirts, while the older generation are mainly into jilbabs and one color/neutral outfits. Since our main focus is on the Voila!, it comes in plain as well as printed colors, and we cover a whole market of the traditional and stylish female population. Since our slogan is "Bouquet of Colors", we are trying as much as we can to keep our collection colorful. We follow the latest trends by adopting the Pantone Fashion Colors for each season. However, what differentiates us, is that we design and draw all our prints and we come up with our own collection every two months, providing as much variety as we can for our customers. Jana: When can we expect your online store to launch? Hala: Insha'Allah we hope to launch our online store no later than September 2011. We will be announcing our launch on our Facebook page, where we release our latest news and updates and also on our website where we will launch the online store, www.bokitta.com. Shukran for this, just FYI the link to the Bokitta Facebook page, doesn't work. Also meant to add that I love the hijab on the first lady of the 6, I hope they will deliver to South Africa when they launch the shop, iA. I love this idea so much! Can't wait! I have this webpage in my favorites and cant wait till the online shopping is on, so I can get some. I hate playing around with pins! i love it..i wish i could have it in my country:(..i saw the video in you tube thtwas lovely and very easy. I really like these, especially the 4th, 5th, and 6th ones! I'm also glad they are made of cotton unlike many other brands. Looking forward to the launch! At first glace, it seems like this hibab style bulky and hot to wear. I just carefully re-read the description of this hijab, and indeed, it IS breathable and cooler than the other layered styles you see. Can't wait to order one..the look very practical to wear and are fabulous-looking. thanks, Jana!